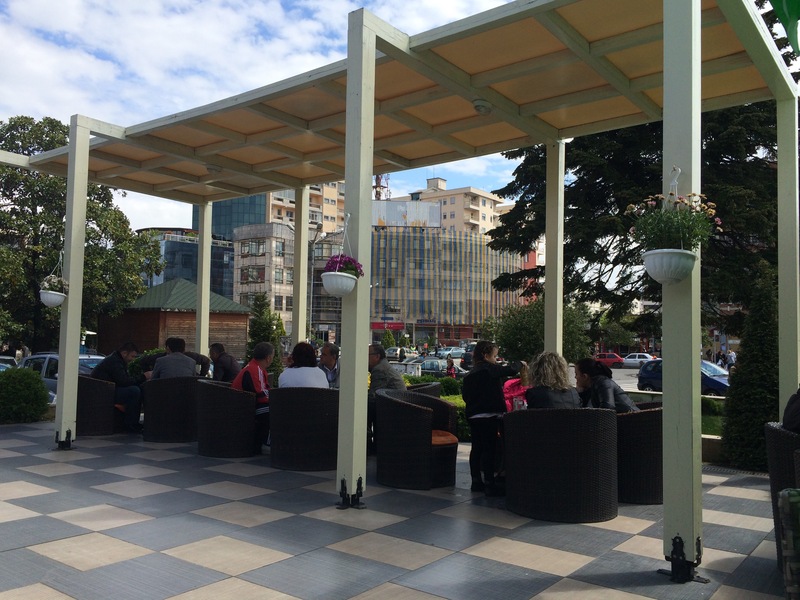 There was not a lot to say about the local city of Shkoder, six miles from the campsite. The weather was good and the city had an attractive pedestrian precinct with small shops, restaurants and pavements cafés. Some of the shops resembled car boot sale stalls but the more modern ones were more like BHS or H & M. I bought a polyester T shirt made in Turkey for €6. 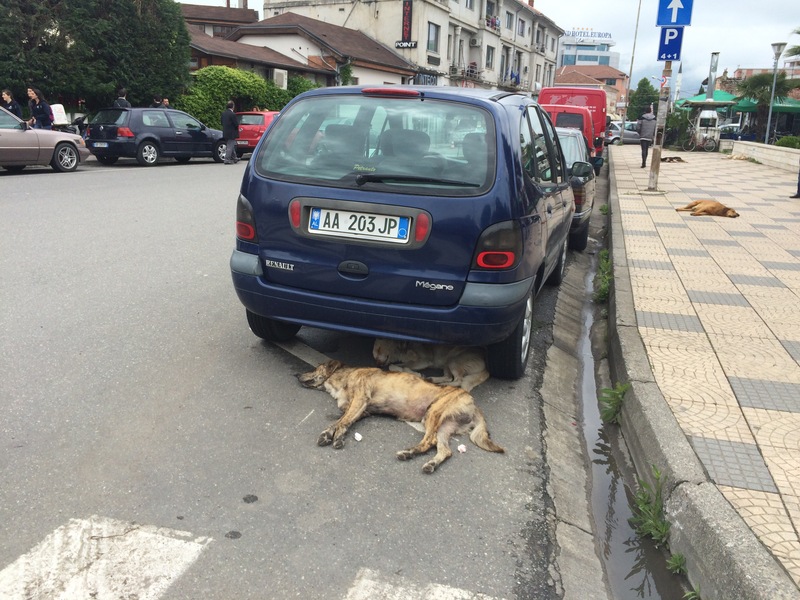 We saw several dogs lying on the pavement and in the gutter and we wondered whether they were alive or not. Much to our relief they occasionally moved and we realised they were sleeping in the sun! There was a scruffy green park with fountains (not functioning), library and museums so the city should have been worth a day’s exploration. 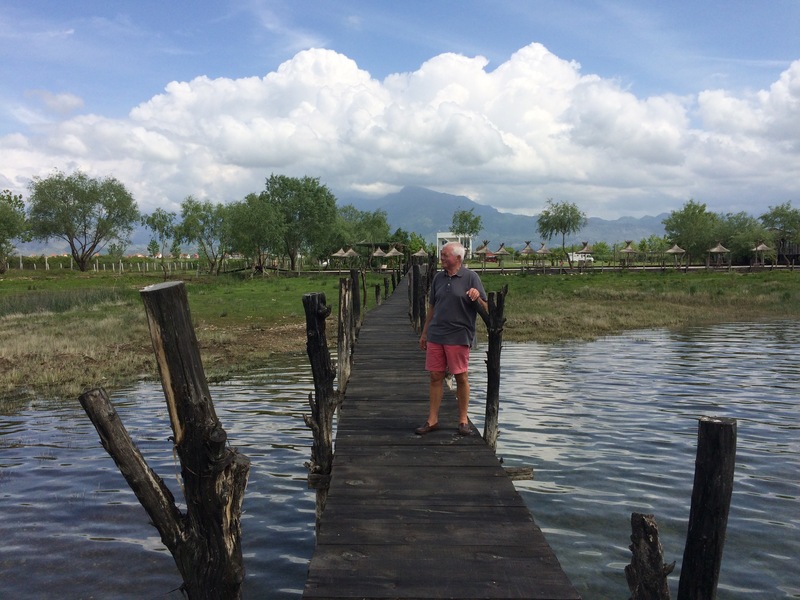 However, its communist past painted a drab veil over everything and after an hour of wandering around and, having enjoyed a small beer at the open air bar outside a hotel (cost £1.20 each with peanuts), we returned to our campsite by the lake. 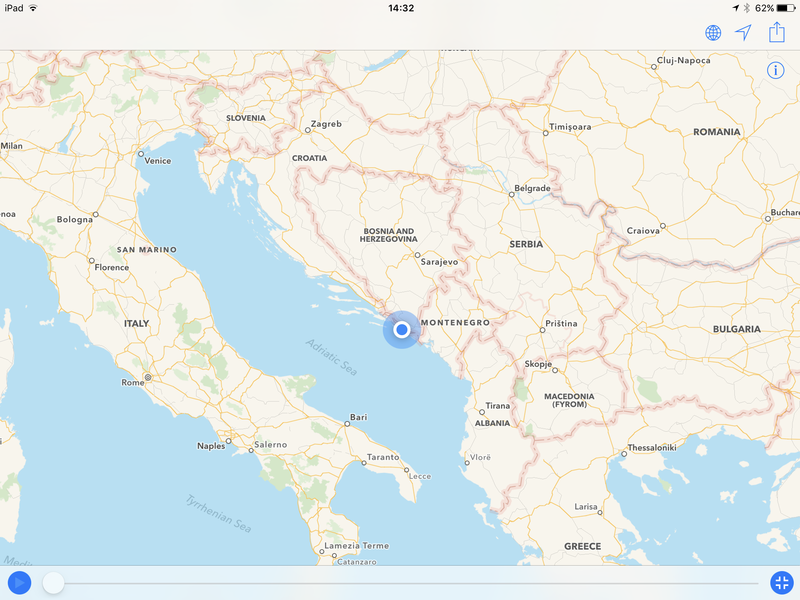 The drive to Albania was a mere hop over the border – red dot heading east to red dot. We submitted our passports and vehicle registration documents at the Albanian border and after five minutes or so we were waved through. We parked up to buy vehicle insurance, €50 for 15 days, although the border police seemed unconcerned whether we bought insurance or not. 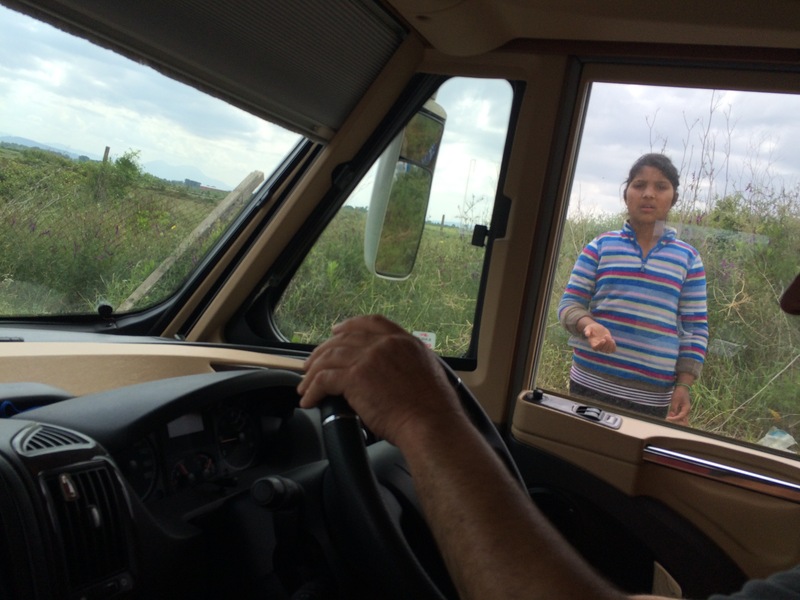 Whilst parked, our vehicle was approached by first a young girl, then an older woman, both begging. They asked for sweets, water and something to eat. Neither looked starving but I gave the young girl 50p. 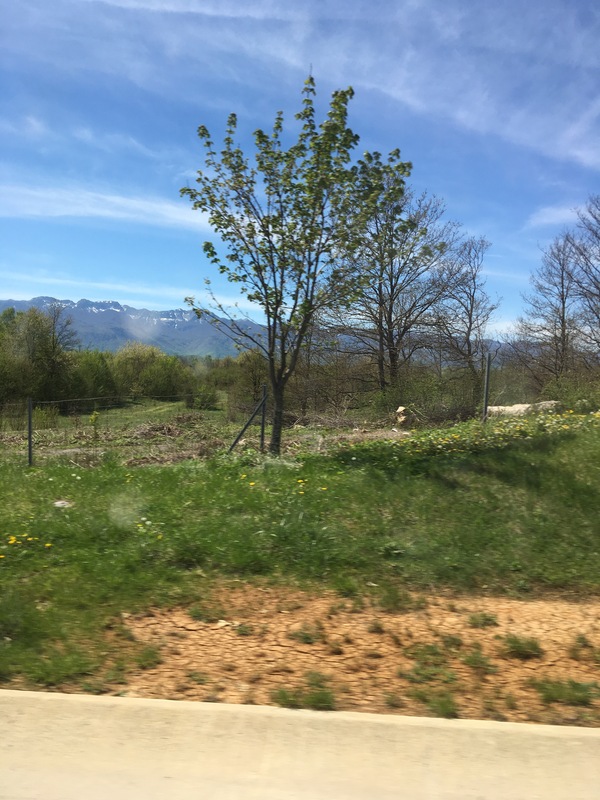 As we drove we were very aware of being in a third world (ex communist) country, some buildings were extrembly ugly, the condition of the roads was even worse than Montenegro and there were fewer roadside facilities – petrol stations, restaurants, supermarkets and so on. 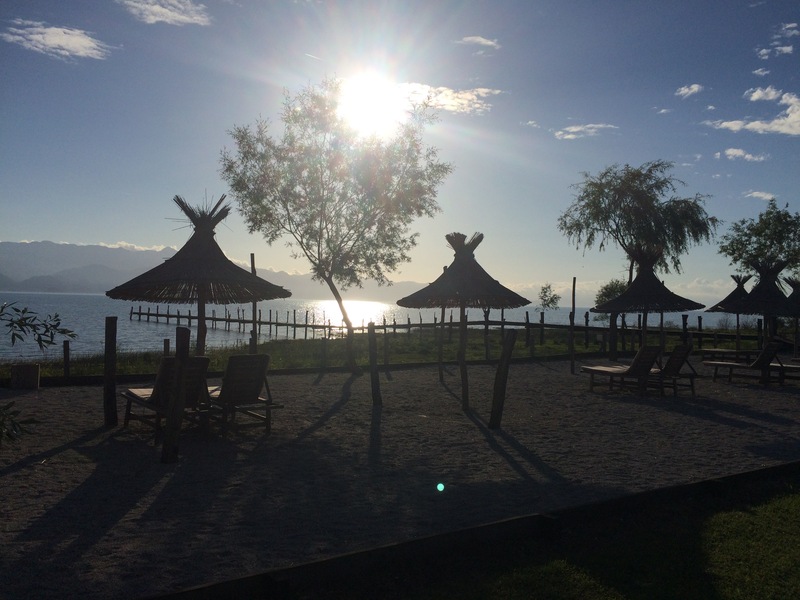 However, when we arrived at our chosen campsite we were pleasantly surprised. 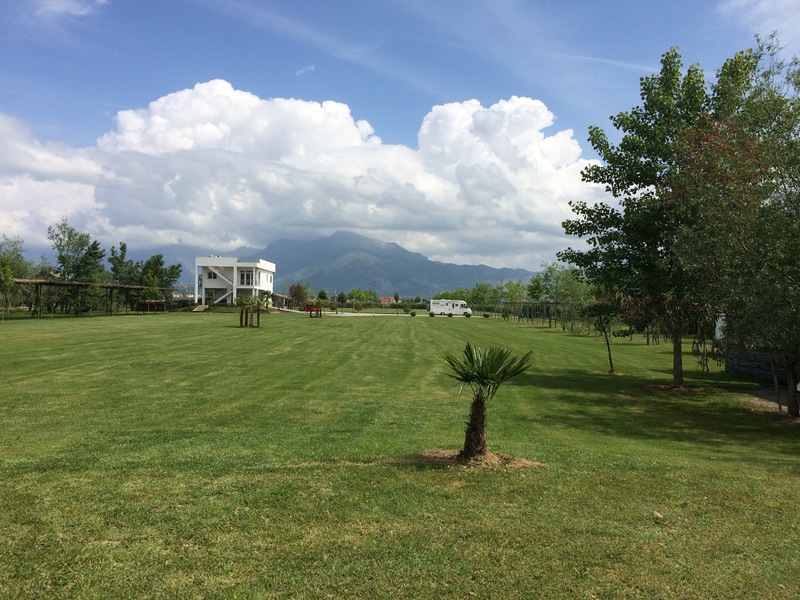 We found a spotless site beside the Lake of Skadar with lawns recently mown and a newly built toilet block. 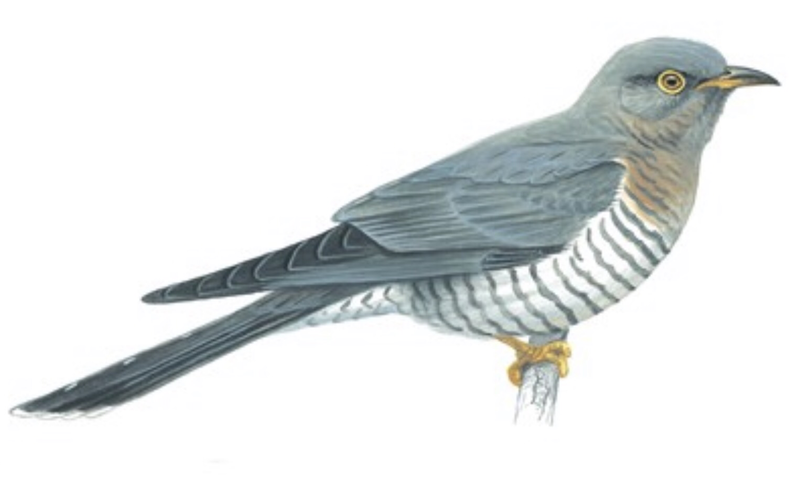 We heard, and saw, a cuckoo. English was the common language and the € was the accepted currency. Montenegro, meaning “Black Mountain” lay between Croatia, Serbia, Kosovo and Albania. 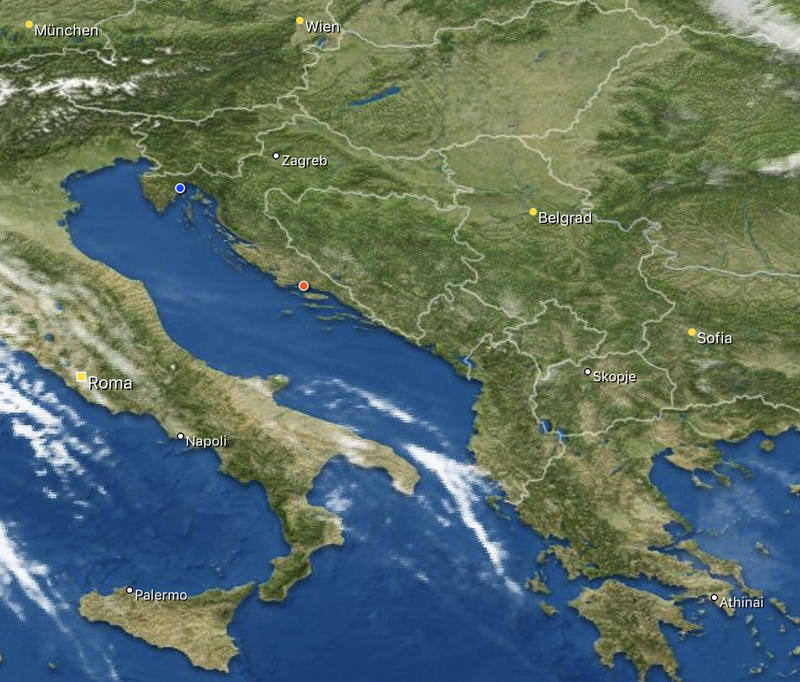 The republic had a long Adriatic coastline and high mountain ranges. Half the country was covered in thick forest. The Tara river canyon was the deepest and longest in Europe. We were now outside the EU but everything was priced in euros and most people seemed to speak English. We had to pay €18 for third party motor insurance before they would allow us into the country. 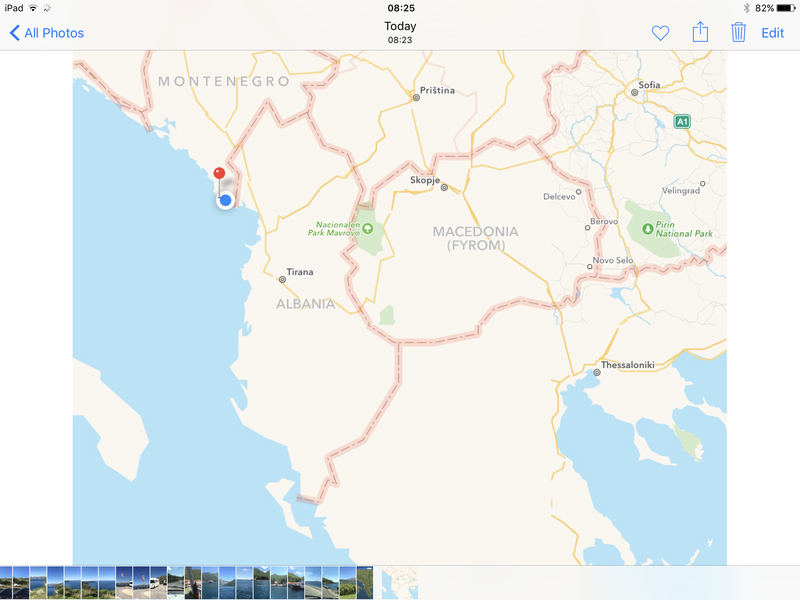 The drive from Dubrovnik to Ulcinj, Montenegro was only a hundred miles but it took a long time on a busy, single carriageway road. Our route followed the coast line and the scenery was spectacular with its rocky shore line and small bays with sandy beaches. The sun was shining and the sea projected a wonderful aquamarine colour. At one point a ferry took us across a narrow causeway between two peninsulas. The ferry cost €9 and saved us many extra hours of driving. Tourism was a major industry in Montenegro and along the coast we saw some seriously plush hotels, as well as rooms and apartments for rent. There was a lot of new building going on and plenty of FOR SALE signs written in English. The further south we drove, the less developed it became. 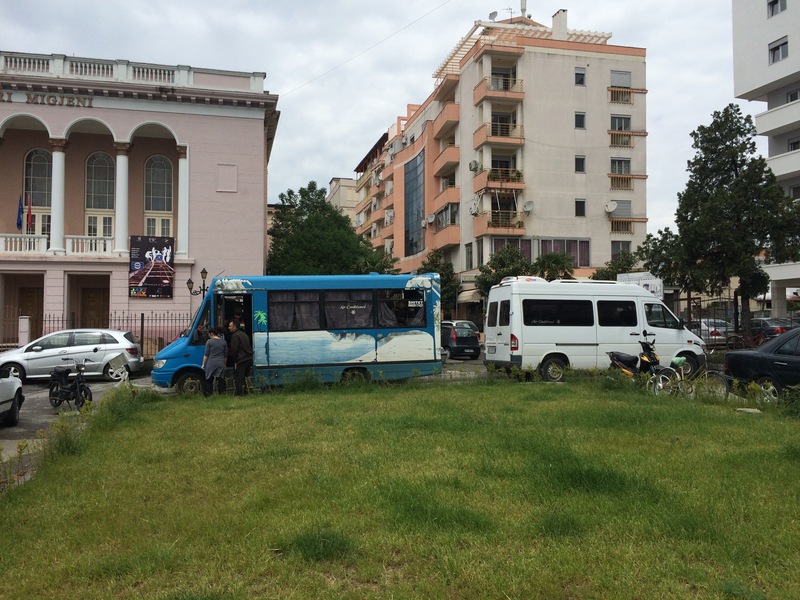 Our camp site was outside the town of Ulcinj at the top of a long beach, surrounded by pine trees. There was a a big circular wooden building on the site that served as a restaurant, open all day. We paid €45 for a Greek salad, grilled fish, meat and lovely grilled vegetables with a litre bottle of local red wine. The weather was sunny but with a chilly wind; we could imagine the site in the heat of the summer crammed with visitors. Right now there were eight or so other vans on site, all German. The vast majority of travellers we came across were German; we met hardly any English – if you ignore a totally barmy couple we met in Asti from the Isle of Man! 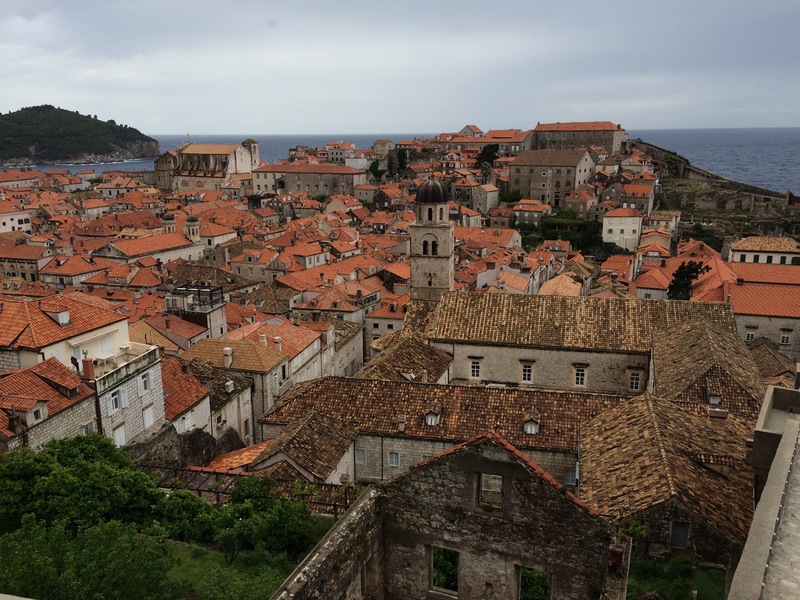 Our camp site was at Solitudo on the outskirts of Dubrovnik, a well preserved medieval walled city whose past wealth came from its maritime trade. 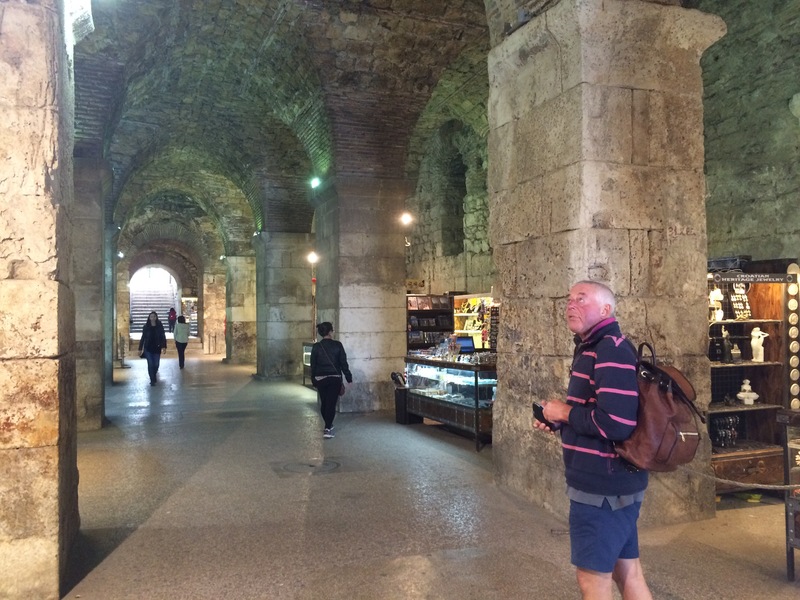 We caught the number 6 bus from Solitudo for a fifteen minute ride into the old city the following morning. 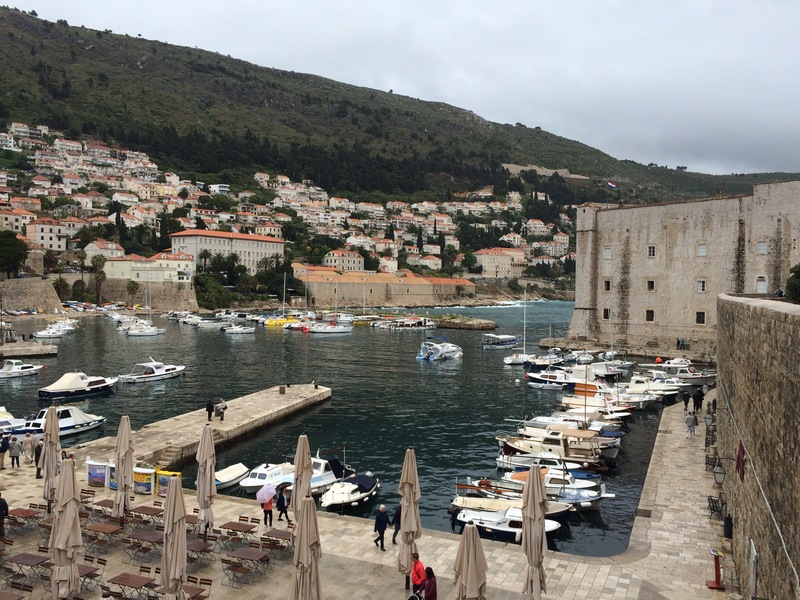 It had been raining all night but, according to the forecast, the weather was improving and the rain had just about ceased by the time we disembarked and walked through into the narrow alleyways of the old town. 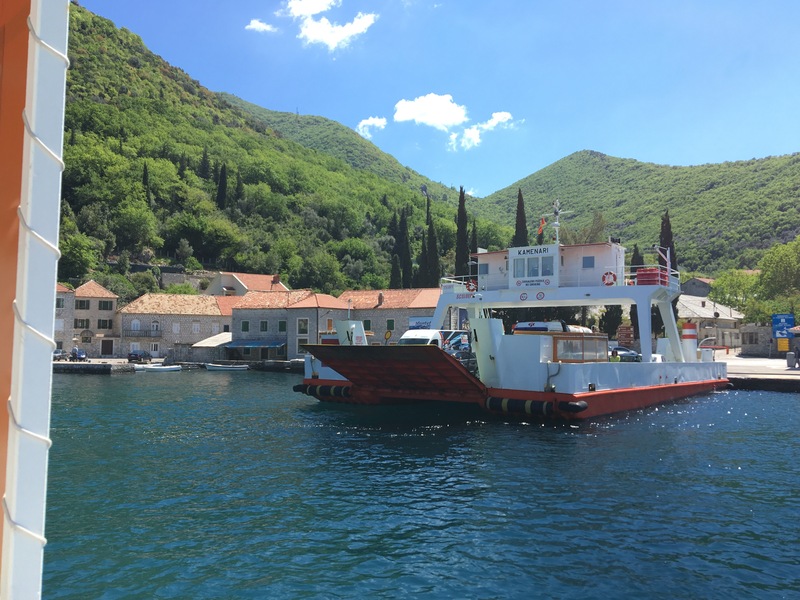 We spotted a large cruise ship moored at the docks and before long we joined a throng of British tourists milling around the squares and narrow streets – our ears immediately tuning into their snatches of conversation. Fortunately they were walking around in small groups, unlike Venice where there would be thirty or more in a group following their leader, making movement difficult. 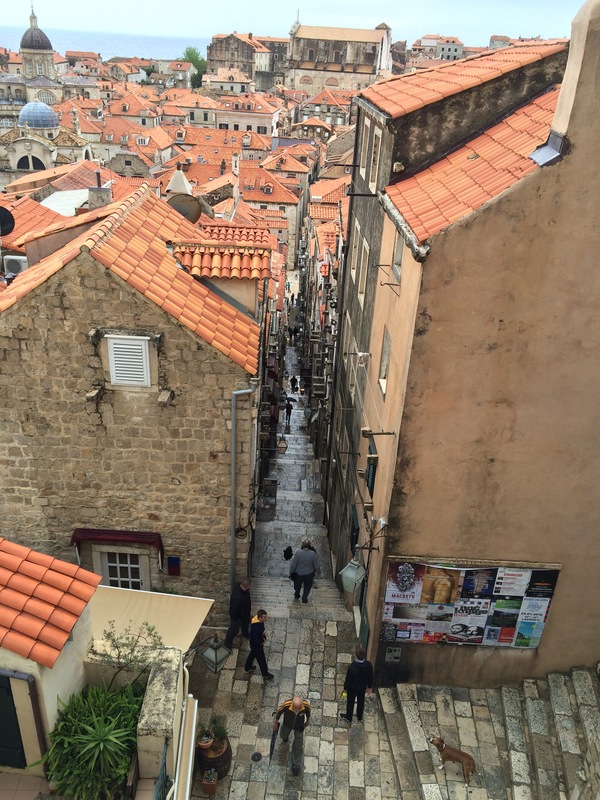 We climbed up many flights of steep steps to the top of the city walls where we were charged the equivalent of £12 each for the privilege of walking around the city walls. It provided a good view of the old city and there were fewer tourists who were fit enough to negotiate the steps to enjoy the wonderful view of the bright roofs and the harbour. Our journey south started in the pouring rain. 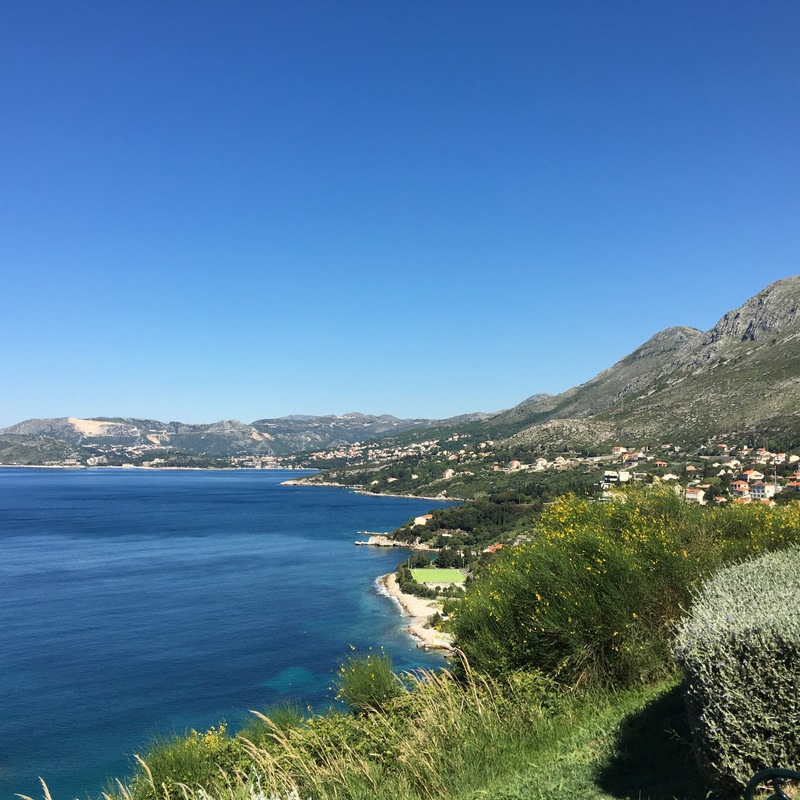 We were travelling from Split to Dubrovnik on a deserted motorway that ran through a mountainous wilderness dotted with the occasional isolated community. 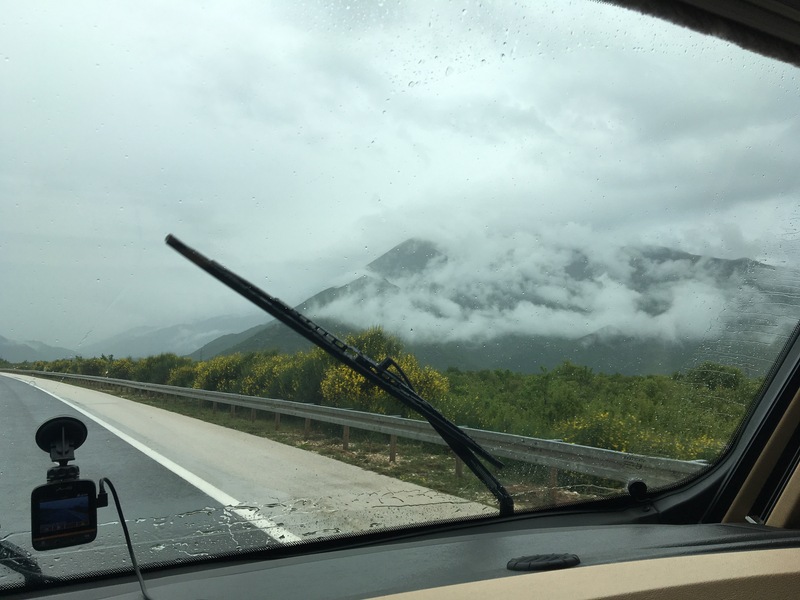 There were very few exits from the motorway and virtually no fuel stops, just green covered hills and the occasional tunnel through the high mountains, the summits draped in low cloud. Some hours later we came to what we thought was a toll booth on the motorway but it turned out to be the border post into Bosnia and Hertzegovena. We were leaving the EU and we had to show our passports before we were waved through. 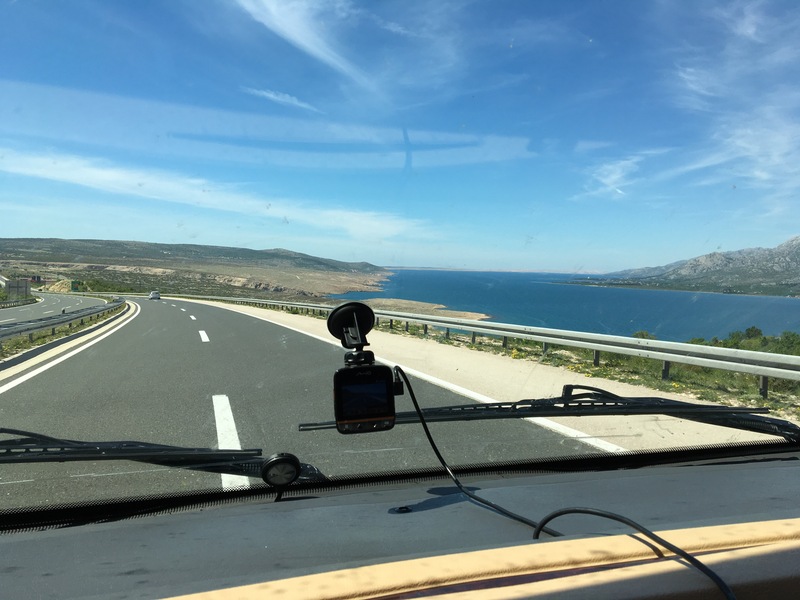 Half an hour later we crossed a second border which took us back into Croatia – where they barely glanced at our passports. We were now on the coast road and were delighted with the views as we travelled up and down hills, circling bays that overlooked red roofed towns and small fishing harbours. 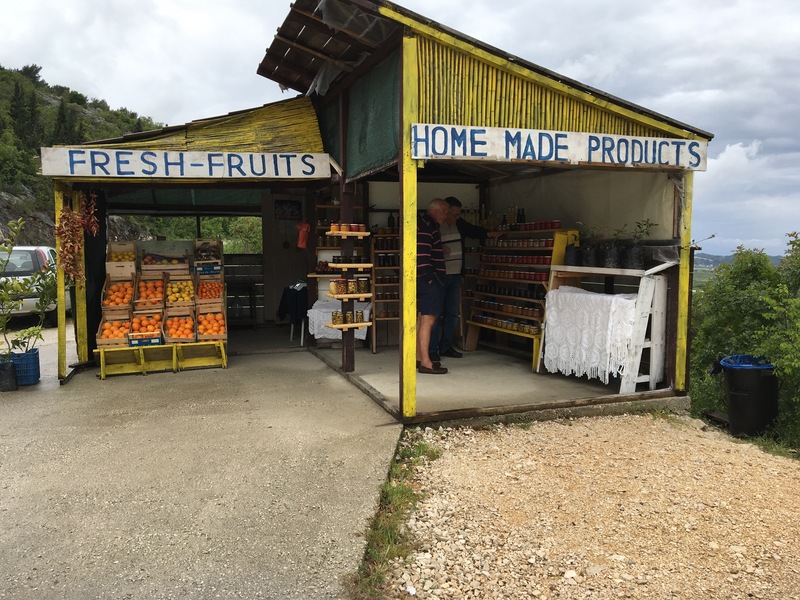 We stopped at one of the many roadside stalls and bought dried figs, home made jams, black honey and figs and some oranges (note how the signs were written in English). We saw many small islands just off the coast, some of which were accessible by road from the mainland. There were a lot of campsites in the area and we were tempted to stay as it was very beautiful, in spite of the dull weather. We could imagine how fine the view would be if the sun were shining. 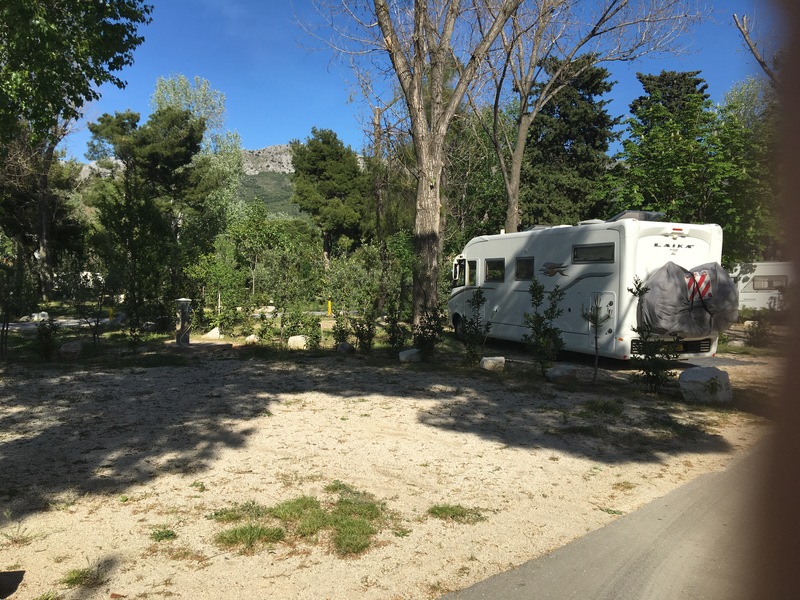 We stayed three nights at Stobreč near the port of Split. 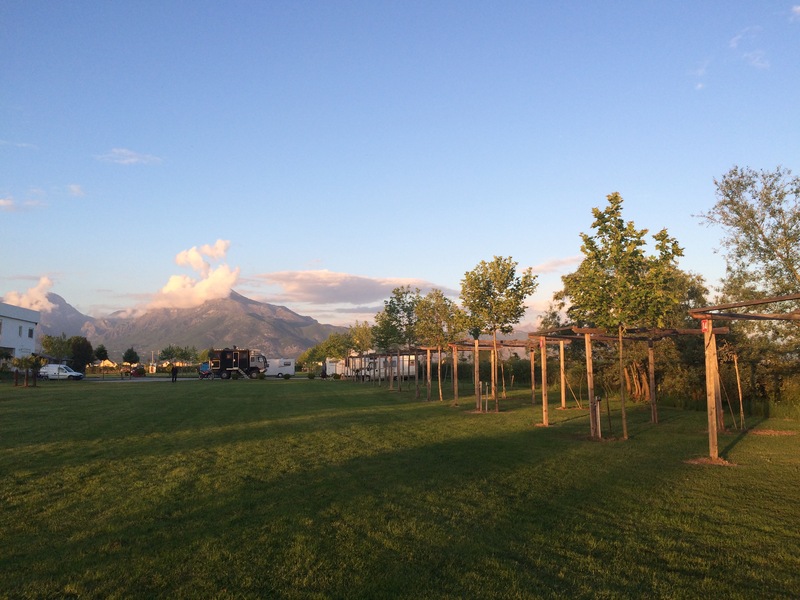 The campsite was excellent with clean, modern facilities but we were disappointed with the surrounding area which was a dual carriageway and industrial units – plus playing fields – the former were ugly, the latter noisy. We walked down to the harbour in the evening and had a good meal in the only restaurant. 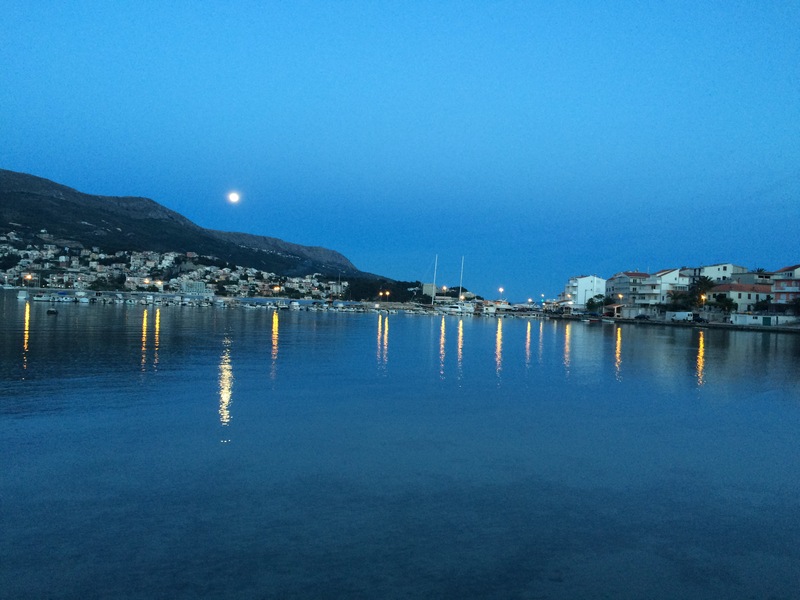 There was a full moon as we walked home and noticed that that the view looked much better after dark – or was it the bottle of wine we had just drunk? 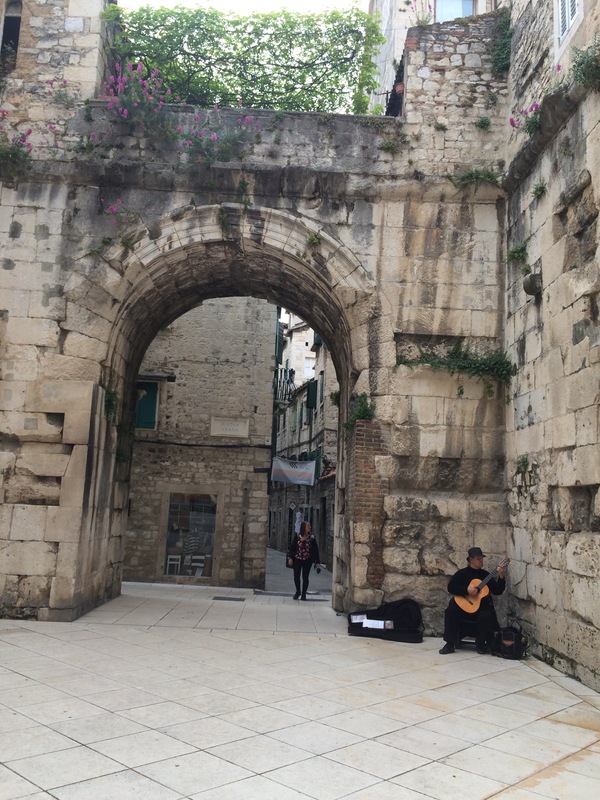 We caught the bus into Split, a journey of twenty minutes. 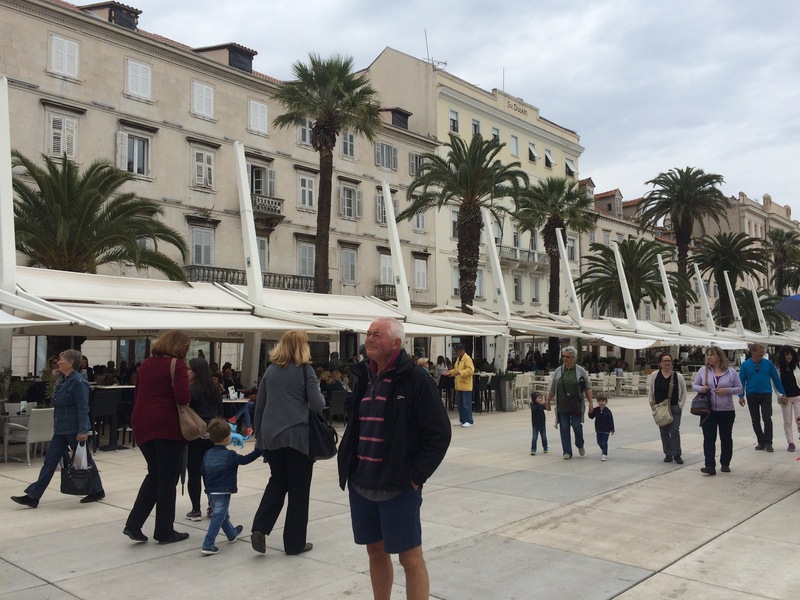 It was a lovely city with a handsome esplanade filled with cafés and market stalls. The older parts of the city dated back to early Roman times; the paving stones under our feet were worn quite smooth with age. 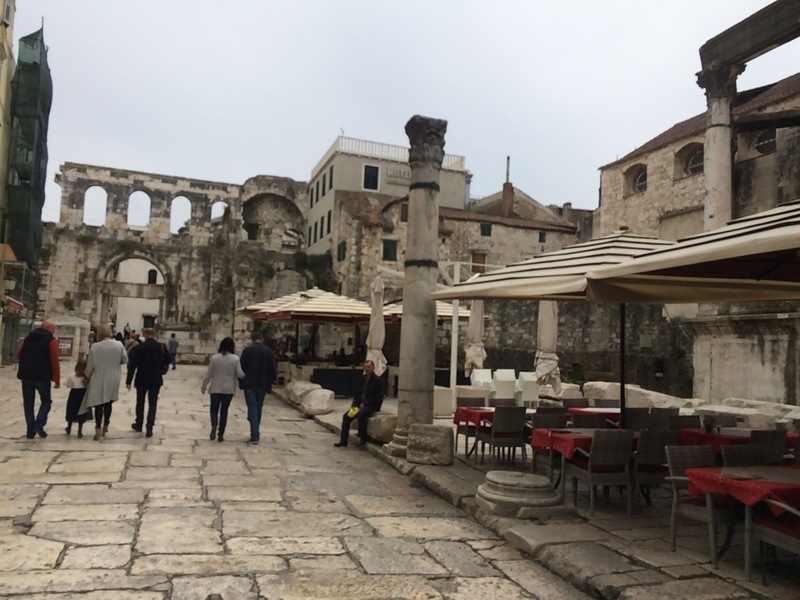 The ruins of Emperor Diocletian’s palace formed the centre of the old city, you could walk through any of the four portals and admire the ancient arches forming the cellars. Surrounding the palace were a maze of narrow alleyways with shops and restaurants. 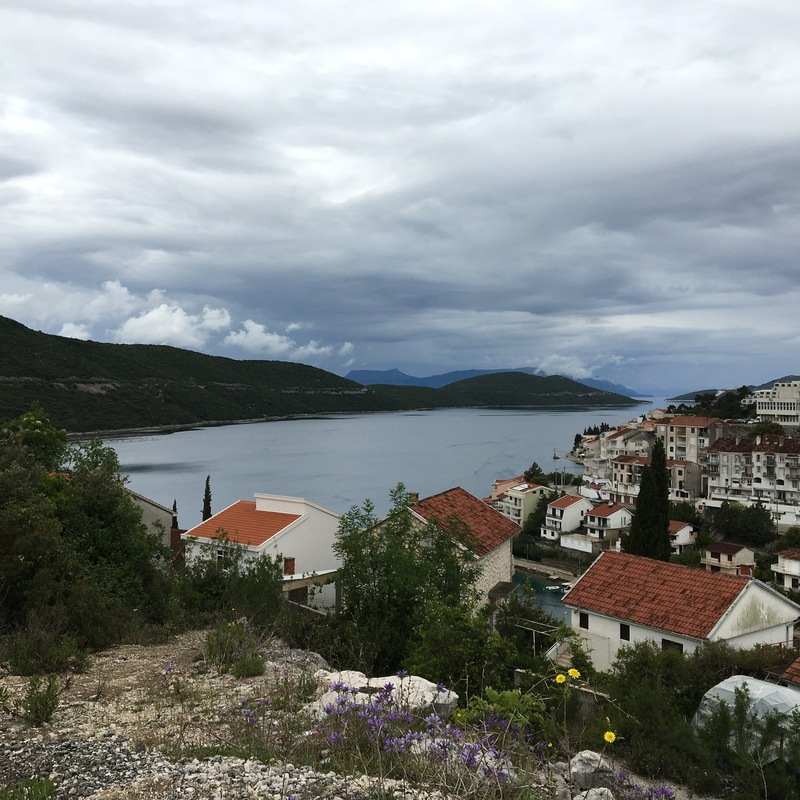 After two enjoyable days we left Draga and drove south to Split on the Dalmation coast, a journey of five hours. Croatia joined the EU recently and we made excellent progress on their new and fairly empty motorway (blue dot to red dot on the map). We passed through some beautiful countryside, green hills dotted with bright terracotta roofs, giving way to tunnels and mountains, topped with a little snow. We drove through a National Park, passing lakes and mountains where we spotted roadside warning signs showing an image of a bear and a wolf but, fortunately no corporal sightings!